I’ll be in California this weekend at The Other Change of Hobbit along with Claude Lalumière (!!!) and Tim Pratt (!!!) From 4-6pm this Sunday, we’ll be there reading from and/or talking about our books, life, the universe, and everything. Thanks to a short-term loan, our doors are open for sales again, after a six-month hiatus. To help keep those doors open, and to help us pay back the loan, please come down and have a browse. And buy a book. Or two. 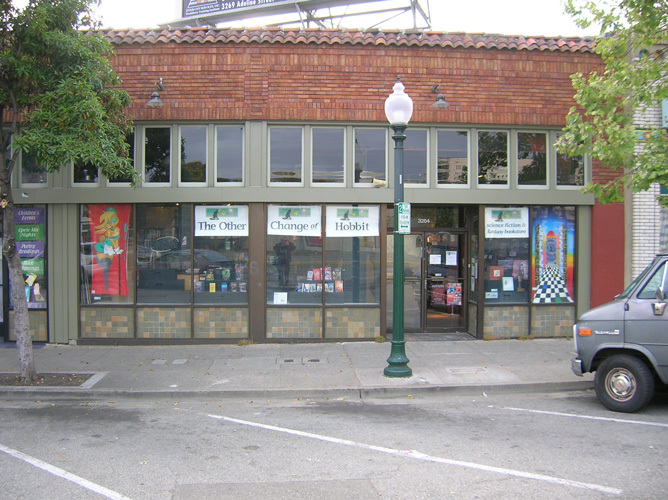 The Other Change of Hobbit is in South Berkeley at 3264 Adeline Street between Harmon and Adeline. Come say hi! Posted in UncategorizedTagged other change of hobbit, public appearance, road trip!